Hot Summer Spot: Inflatable Island Philippines! A few weeks ago, I was able to kick-start Summer of 2018 with a water activity with my friend Ava. I may not be a girl of this season, dreading the heat and the tight outfits people go to in this temperature, but a good consolation is the chance to try out fun, outdoorsy activities I won't even attempt on rainy or cooler days. This is the Inflatable Island PH, a fairly new, Instagram-worthy resort located in Subic (few hours away from Manila). We got there a bit late for the media event, but was able to maximize the short stay by directly availing the water maze aka the "Floating Zoo"! I bought a phone plastic protector so Ava and I can still take pictures and videos even when on the water. 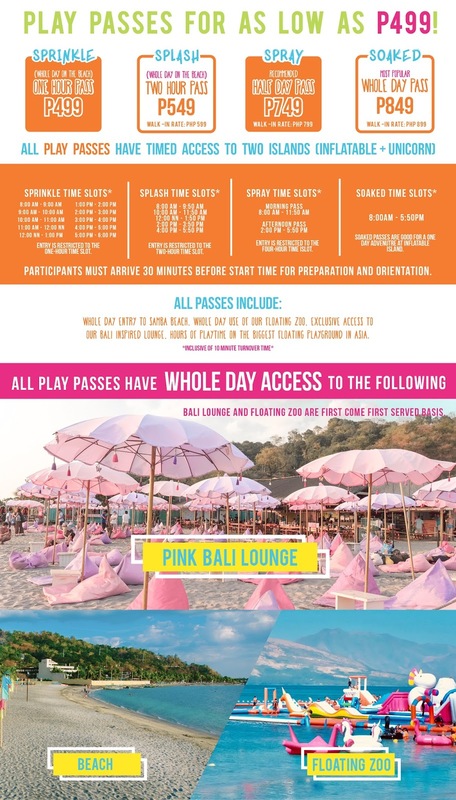 We were also able to watch the sunset while riding the flamingo floaters, and chill at the Pink Bali Lounge with our iced tea before heading home. Overall, I really enjoyed the amenities of this resort. Medyo bitin! But it is unique and fun, plus at the same time safe pa sya with all the protocols prior going to the water, and all the life guards on standby when we were playing. Sharing some of the one million pics I took during my visit!! Haha! Your barkada or your whole family will love it here! Check out the Inflatable Island on your next road trip! ohmygosh! sobrang cute naman here!! Gusto kong puntahan! Saw this already before but your post talaga, sobrang cute nya! pink kasi fave color ko haha.